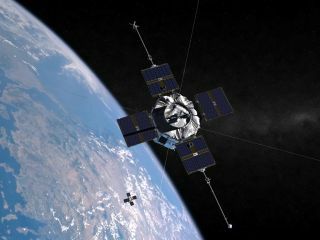 The Radiation Belt Storm Probes Mission, part of NASA's Living With a Star program, will provide unprecedented insight into the physical dynamics of the radiation belts. A NASA spacecraft has made the clearest record yet of choruses of noise in the Earth's magnetosphere. The chirps and whoops were captured by one of NASA's two recently launched Radiation Belt Storm Probes spacecraft, whose mission is to understand more about space weather. "My wife calls it 'alien birds,'" joked experiment principal investigator Craig Kletzing, an astronomer at the University of Iowa. The "alien birds" sound happens in radio waves, in a frequency humans can hear, as lower-energy particles transfer their energy to higher-energy particles. The energy transfer generates the noise, and researchers suspect it also generates waves of plasma that affect one of the important processes of space weather. While researchers have known about the choral sounds for decades, the $686-million RBSP measures these sounds in higher resolution than any spacecraft that came before. With better understanding of the data will come greater knowledge of space weather. Since solar storms can short out satellites and affect hydro grids (a famous example being the Quebec hydro grid in 1989), researchers are eager to predict the weather to minimize the effects. RBSP is a small step toward those predictions, Kletzing said. The great strength of RBSP, he added, is the two satellites allow measurements on the extent of a space weather "event." "Otherwise we don't know how broad the region is; it may be large or small. ... We can start to get the extent of the region mapped." The RBSP mission launched Aug. 30 and is still in a 60-day "commissioning phase" as the experiments and hardware are tested out. The two spacecraft wander within the Van Allen radiation belts, orbiting anywhere from 311 miles to 19,417 miles (500 to 31,250 kilometers) above the Earth. One spacecraft laps the other in orbit about every 75 days. The Kletzing team's experiment is called the Electric and Magnetic Field Instrument Suite and Integrated Science (EMFISIS). The experiment's sensors sit on the edge of two large booms, on either side of the spacecraft. When fully extended, each boom will extend about 10 feet (three meters) from the spacecraft. EMFISIS needs to sit as far away as possible from the spacecraft to avoid recording interference from the other instruments and the spacecraft itself, Kletzing explained. It was one of the first instruments turned on, partly to monitor and manage any spurious signals from the spacecraft. The "chorus" sounds are only one of a suite of noises the EMFISIS team is listening for. For example, EMFISIS can detect the boundary between areas dense with particles and areas with fewer particles. It also measures waves associated with ion gyrations around magnetic fields. Hydrogen, helium and oxygen produce their own gyration frequencies, creating waves at frequencies below human hearing. Mapping out these particles would provide a clue about the composition of the magnetosphere. "With space weather, we'd like to get to the stage of prediction, but that's a ways off," Kletzing says. "To understand how the physics actually work, you need to get a better model and understand that model." RBSP's prime science mission is expected to run two years, which Kletzing calls a long time for spacecraft constantly bathed in radiation. Most spacecraft avoid the Van Allen belts because of the need for extra shielding and special parts. "But we built ours to last," said Kletzing. Collaborators on the EMFISIS experiment include the NASA Goddard Space Flight Center, the University of New Hampshire, the University of California at Los Angeles and Los Alamos National Laboratory.